The Sierra Sun has a good collection of articles of interest to those heading out to Boca Springs. The Visitor’s Guide lists the area campgrounds and their features. An October story about the logging industry talks about the dams and facilities built to assist loggers. Going with the flow: watermaster’s job a struggle discusses the balancing act between required river flow and the Tahoe Lake level. Ghosts of the Truckee River canyon; Once bustling towns gone but not forgotten describes the history of the canyon from Truckee to Verdi and provides some ideas for things to look for in this area. History of Truckee ice harvesting industry remembers the time when California salad was helped on its way east with ice to keep it cool from the Boca area. SFGate (San Francsico Chronicle’s website) has two stories on the Interstate Highway system at age 50. One is nostalgic remembering what was (State’s old highway system: a slow, perilous drive down memory lane) and the other more of a history (America in fast lane with no exit Freeways have changed our way of life and given birth to new industries). Read the second with your skeptics hat on as the San Francisco Bias in on full display (have to, absolutely have to, balance any positive with a negative when it comes to any modern marvel). A lot of us on the road now are old enough to remember the Grapevine as a perilous grade with switchbacks and little crosses alongside the road to mark crash deaths; having to get on the road early to cross the desert so the in-window swamp cooler could provide some relief; seeing the old cross-tie road just past the shoulder; being able to pull off the road nearly anywhere for a night’s sleep; – you can still find this as, for example, US 395 especially in Oregon and Washington, but most of the time trip planning is getting there and the freeway makes it easy. UPDATE: The Summer 2006 issue of Invention & Technology story on the history of Jersy Barriers says the grapevine was where these traffic control devices were first used in 1936. About the only holdout for film anymore these days is the disposable camera. Digital cameras have the advantages of the old Polaroid immediate review and are available in nearly any size and with nearly any feature set you can imagine. The newer digital cameras are also very smart and able to help you take great pictures of your travels even if you aren’t paying much attention to photographic necessities in taking your pictures. Here are some websites with information to help you learn to know what to pay attention to in taking pictures. They can help you create better pictures that others will admire and enjoy your sharing with them. Most of these websites are selected pages and you can browse around to find other related pages if you like the presentation or the way the author describes things. How to Photograph Sunrises and Sunsets – The drama of the color and shadows and vistas make a good sunrise or sunset photograph a good opener or exclamation point in your travelogue. Here’s how to add a stunner to your photo gallery. How to Make Great Photographs © 2005 KenRockwell.com – It is not the hardware, it is the artist! Ken has a lot of good tutorials on his site and this one will help you put together the photographer’s attitude to make for better pictures no matter what equipment you use. Free Image Hosting at AllYouCanUpload.com – one place to put your pictures so everyone can see them. You can use this service to store photographs that are linked in email or posted to your discussion groups. photonotes – This set of notes features the Canon EOS but has a lot of good information for the digital camera photographer. PhotographyJam – the photographer’s resource: Camera basics: shutter-speed, aperture and ISO – a good introduction to getting the light right on your photographic subject. As a rule of thumb, figure that for every penny you spend on gas you spend another on maintenance and upkeep of your vehicle. And then for every penny on fuel and maintenance, add another for depreciation, insurance, and other costs. In other words, fuel is about a quarter of you overall vehicle costs. Here are some links to help you manage these costs. Finding current prices – where to find the best places to fuel up right now where you are. USA National Gas Temperature Map – a color coded map that shows gas prices county by county – a good way to figure where to by gas on that cross country trip. Gas Prices – MSN Autos – Reno Nevada selected link show map of stations with a table of prices at each. Nevada Gas Prices – Find Cheap Gas Prices in Nevada. This link selects the Reno and Sparks Area for a list of stations with their price as reported by volunteers. This site makes it easy to select search criteria for location and fuel type. safety_pump.pdf (pdf) – Exxon quick reference about safety at the pump. phone while pumping gas dangerous? Fil’s Auto Corner: Gasoline FAQ – learn what octane is all about. Tire Tech – Air Pressure – Learn about why the pressure in your tires is important for optimum performance. Storage – don’t let your gas get stale and gum up. Politics and Inflation – The price of fuel has a lot to do with government, economics, and people. political issue and learning a bit about the history of fuel prices and attempts to control it can help you make good decisions. Consumer Price Index (CPI) Inflation Calculator – what a dollar can buy changes over time so the actual dollar price of fuel can be misleading as an indicator of its cost. This NASA calculator lets you compare actual costs based on an analysis of what the dollar could buy at different times. What Was the Inflation Rate Then? – learn a bit more about how money is related to the goods and services it can buy as this relationship changes over time. Sway Control Next Mandatory Safety Feature? SF Gate reports on a Stability system called best thing since seat belts. Read carefully and you will find it is an electronic system that addresses trailer sway. Stability control systems use computerized electronic sensors to detect when a car veers sharply and when a driver is about to lose control because the car has started “straying from the intended line of travel,” the insurance institute said. That “straying” usually means a high-speed maneuver — either intentional, such as trying to avoid a child who suddenly steps into the street, or unintentional, such as skidding on a slippery surface. At that point, the stability control system activates the brake on the wheel most likely to correct the vehicle out of its slide. The system also sometimes automatically reduces the vehicle’s acceleration. The system is “terrifically important on SUVs in particular,” said Ken Digges, a George Washington University auto safety professor and former senior executive at the National Highway Traffic Safety Administration. Pay particular attention to the ideas: “high-speed maneuver” and “straying from the intended line” — “a delay between the time you turn [the steering wheel and the time the tires and suspension respond” — “SUV driver is totally out of sync and can’t control it” — An SUV is the kind of vehicle used to tow trailers. Sway is exactly the kind of thing they are talking about. Airstream tried a similar system on their trailers a while back. It used a motion sensor to detect sway and applied selective braking to reduce it. That effort was perhaps too bleeding edge and didn’t go over very well. These new systems are designed for the tow vehicle along. How they will react to trailer influences remains to be seen. But do consider this in light of the integrated brake controller Ford is providing with their pickup trucks. It may well be that, one of these days, you will be feeding two brake lines back to the trailer so the tow vehicle can use selective trailer braking coordinated with its own behavior to improve overall trailer handling. UPDATE: Curious Cat reports on a study that indicates that electronic sway control could reduce traffic deaths by as much as 33%. That’s 10,000 lives saved. The word is that there will be no wireless I’net access at the WBCCI International Rally unless you bring your own. This would be an interesting place to experiment with mesh networks where those with EVDO or satellite connections could create a shared access scheme. That would be bleeding edge and then some. Meanwhile, plan on going down to the library or local coffee shop if you have to get your I’net fix and don’t have another solution. 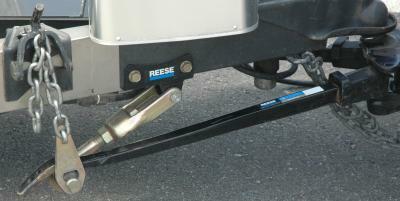 Here is one side of a Reese Dual Cam sway control hitch. The ‘cam’ is the end of the spring bar – notice its curved shape as it sits on the bracket bolted to the A frame (lower left corner of the picture)? If the angle between the trailer and the tow vehicle changes, the spring bar will move back and forth along the A frame. This is because its attachment to the ball mount assembly is an inch or two from the trailer ball and it will be on the inside or outside of an angle depending upon which way the rig is turning. As the spring bar moves, its curved end will move over the ‘cam’ that is mounted to the trailer A frame. Since it wants to sit in the middle, it will resist the rotation around the ball damping sway. It was a case of taking things apart to figure out why the awning would not extend. The reason was that the roller tube would bend and unrolling a bent tube required a careful technique. Here’s a photo gallery of what was found when the awning was dissassembled. Anyone planning to head from I-5 at Medford to either Klamath Falls or Crater Lake will need to use a different route. No indication when the highway will be opened. Oregon Tripcheck says it may be open for one way traffic June 11. It always pays to do a quick route check before heading out! The June 2006 Newsletter has been posted! See this link. If success is measured in pictures, the May rally in Unionville was a huge success. Randy, Jerry, Don, and Dave were among those who provided pictures for this event. Check out all the photo galleries. The SNU needs your input. Now is the time for you to help us decide where we will hold rallies in 2007. Please take a few minutes to fill out the on-line form and let us know your thoughts. The open house at Mt Family RV was a great opportunity for SNU members to get together as well as to talk with potential Airstream buyers. See the SNU photo gallery of the open house. We also got to meet Rich Luhr, editor of the magazine Airstream Life. and Rich Charpentier, author of the Digital RV. For Rich Luhr’s comments on the event check his weblog. The next SNU rally is June 22 through June 25 at Boca Springs. For more information check the web. Be sure to check the photo galleries and read the information sent to us from Wally Byam’s second cousin Dale “Pee Wee” Schwamborn. Fascinating history. There was an old Spartan trailer on the Unionville Schoolhouse grounds. A bit weathered but the insides still showed a design for living with beautiful interior wood paneling. Did you know that there is a discussion board for lead acid battery desulfation? Home Power Magazine got this started with an article about bringing sulfated lead acid batteries back to life with a high frequency approach. A followup with Some help and information for builders has information about this approach and links for those who want to find out more. Anyone with soldering skills can build the unit. There are many reports of successful battery reclamation after more than a year of testing, so it can be safely said that this technique is valid. While there are a number of commercial units available now, this circuit represents the lowest cost way to rejuvenate tired batteries. I have included complete technical details so that anyone with typical electronics skills can adapt or modify the circuit to their specific needs. So if you are into building your own simple electronic devices and have some old batteries around to experiment with, this might just be an profitable exercise. You can find out more about measuring batteries at Smart Guage Electonics, a UK company. They make a battery monitor that doesn’t directly measure current in and out. This makes the installation very simple but takes some smarts to provide useful measures.